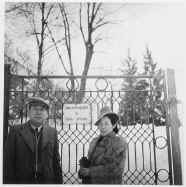 Sugihara and wife Yukiko in Prague. This lesson is part of an extensive eight week Holocaust unit in a tenth grade English/language arts class. After students read background information on Judaism and the history of anti-Semitism, they read Elie Wiesel's memoir Night, view Schindler's List, and analyze poems from the Terezin collection I Never Saw Another Butterfly. We then examine the roles of rescue and resistance as seen in Vladka Meed's On Both Sides of the Wall and in the children's book Passage to Freedom: The Sugihara Story by Ken Mochizuki. The featured lesson on the Sugihara story addresses the multiple intelligences of verbal/linguistic, intrapersonal, interpersonal, and bodily/kinesthetic in an appropriate way that honors student-learning differences while respecting and maintaining the dignity of the content. The theory of multiple intelligences has been put forth by Howard Gardner. Using a model that weds the theory of multiple intelligences to the goal of enhanced performance understanding, Gardner argues that curriculum should address three main elements: truth (falsity), beauty (ugliness), and goodness (evil). He specifically incorporates the lessons of the Holocaust as a way to illuminate the third element, goodness, and its antitheses. Students often deal with the misconception that individuals in the Holocaust were limited in what they could do and how they could respond to the events of this time. The Sugihara story is an excellent model to show students that a person's individual choices and actions can make a profound difference in the lives of others. The focus of this lesson directs students toward understanding the immense potential each of us has in making an impact on humanity. Passage to Freedom details how Chiune Sugihara, Japanese consul to Lithuania, wrote visas for Jewish refugees from Poland in spite of the Japanese government's instructions not to do so. Seen from the point of view of Sugiihara's five-year-old son Hiroki, the story is a testimony to a man's courage to do the right thing. Students will examine the roles of rescue and resistance as seen in this children's book. Students will recognize the act of goodness that Sugihara made in the rescue of Jews in Lithuania. Students will analyze the child's point of view in this story. Students will reflect on significant quotes or passages from this children's book. Students respond in journals to the following question: Do your choices and actions affect anyone else's life? Why or why not? Explain. Students share their responses in pairs, and then with the whole class. The teacher reads Passage to Freedom to the class. Teacher posts approximately six posters around the classroom on the wall at a height where students can easily read and write their responses. At the top of each poster, teacher writes one of the quotes taken from the book. Students are instructed to walk around the room and respond in writing to the quotes that are posted. They should read the quote, others' written responses under the quote, and then write their own response to it. This method gets students to reflect while up and moving. 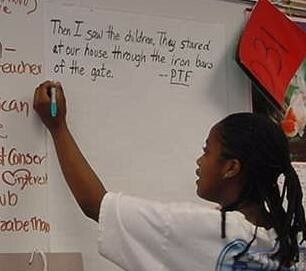 Discuss the student responses to the different quotes as a whole class. Mochizuki, Ken. Passage to Freedom: The Sugihara Story. New York: Lee & Low Books, Inc., 1997.